At a colourful reception organised by the Kimberly branch of the Divine Life Society of S.A at the City Hall, Swami Venkatesananda was officially welcomed on behalf of the community by the Mayor, Mr L. Jawno. Speaking on the subject “Religion for the Modern Man”, the Swami said that like diamonds, God was also hidden deep within us and it was necessary to crush tonnes of evil mass in order to discover the divine. It was time we subjected ourselves to introspection and examined ourselves to see if we were living aright. Life had a deeper purpose than mere eating and living. In order to render the soul pure, it is necessary to keep it free from unwholesome and profane influences. Much time is spent in the care of the body, very little of the soul. Every minute of our existence is precious, but we are wasting time in vain unnecessary attention on transient things. It is necessary to devote more time to the culture of the spirit. All religions were so many different ways to dig the diamond that made one spiritually rich. Yoga means the recovery of the soul and this is to be achieved through very simple practices such as service and love for one\s fellow beings, and meditating upon the Lord’s name. We must eradicate all selfish desire if we wish to be in the grace of God. God dwells in all beings and if we could find the hidden God within us then we would have found peace. If love is enshrined in the hearts of all, then there would be no destitute, hungry or diseased in out midst. Mayoral Tea Party At a Mayoral Tea Party given in honour of Swami Venkatesananda and attended by the Deputy Mayor and members of the City Council, the Swami said that is was a tragedy of modern civilisation that it was necessary for man to resort to drugs in order to induce sleep. Sleep was God’s gift and because man had shifted himself from the centre to the periphery, of his existence, allowing the mind to be occupied with matters of a material, temporary and passing nature, he was not able to enjoy this heavenly gift. “Standing precariously at the periphery, man is whirled in this merry-go-round called the world and he loses his head, gets worried and feels insecure. The mind is in a whirl all the time; there is no peace and there is no rest. 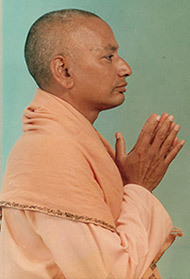 He can have this rest only if he can restrain the mind,” said the Swami, and appealed to those who heard him to utilise the Yoga breathing at least to tranquillise their minds and enjoy freedom from tension which was ruining the health and peace of the modern man all over the world. The technique consisted of steady, slow, graceful, rhythmic and deep breathing in and out. The ancient Yogi had discovered that mind and breath had an intimate connection; hence when the mind was tranquil the breathing was slow and steady, and when the mind was disturbed by violent emotions, the breath was heavy and laboured too. He applied this law conversely and worked his way to the mind. By steadying the breath and controlling the breathing, he obtained control over the mind. This practice had to become second nature. Otherwise, the mind had its own uncanny ways of evading control. Everyone felt that he was the master of his mind till a temptation came along and proved it otherwise. To illustrate this the Swami gave an amusing story of a how a King who wanted to show his Ministers that his pet cat was more obedient than they, was outwitted by a wise minister who tempted the cat with a rat: and the cat forgot the King, the Court, Ministers and obedience and jumped at a rat Hence the need to cultivate goodness in our daily life, deliberately keeping a watch over the evil tendencies that might lurk in the mind and ensuring that they have no chance to manifest themselves, and deliberately seeing good and doing good, so that, aided and strengthened by the practice of concentration and meditation, goodness will blossom into godliness, and with the path to God-realisation being made smoother by this godly life, meditation itself would be deeper and would lead us soon to God. The Swami said that he had been specially commissioned by his master, Sri Sivandanda to spread the gospel of goodness – the four words: “ Be good, do Good”. The real diamonds were the true seekers not the stones embowelled from the depths of the earth, said Swami at a reception at the De Beers Siva Subramaniar Temple in Kimberley, on the 16th July. Real seekers were rare, but they were valued not because of their rarity, but for their sincerity of purpose and true devotion.